Intrapreneur or Entrepreneur: What's the Difference? Intrapreneur or Entrepreneur: Which One Are You? When a company’s growth begins to dwindle, boardroom meetings grow strained and the finger pointing starts. Executives cry out, "We need a new strategy! We need to hire better people! Our culture is to blame! Our compensation is wrong!" The founder, if he or she is still around, sadly states, "We have more people, resources, and money than ever. But now we are so big we can’t even get out of our own way!" Embarrassed, a politically perceptive staffer serves up a popular buzzword. "Intrapreneurs! What we need are intrapreneurs!" The "hip" executive explains that intrapreneurs are "inside entrepreneurs" who will follow their founder’s example. The intrapreneur, he or she promises, will buck the corporate malaise, risk his or her career to get things done and, is willing to "do the right thing to serve the customer." As everyone looks around the room for this potential savior of growth, what do they see? Most managers’ eyes look down hoping this latest idea dies before making them change or take chances. The owner’s eyes look up and out the window reminiscing about the "good old days" when he or she ran a much smaller and focused company. Back then, everyone was an intrapreneur with "fire in their bellies." 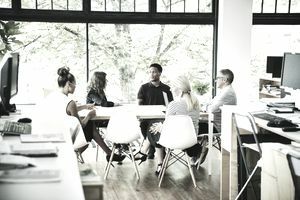 One or maybe two sets of younger, brighter eyes sparkle, expressing hope that their time has come to break suffocating company rules and politics stifling opportunities they see yet feel they cannot pursue. Optimistically, but sometimes fatally, these people seize the moment and volunteer as "champions" of this new company initiative. What happens? Management chooses an intrapreneur hoping that this "champion" is victorious. If successful, will this person become the company’s future leader? On the other hand, will he or she leave and become an entrepreneur on their own rite? Too often, the budding intrapreneur is "beaten" into submission by, and is "forced" to rejoin the first group. Despite their righteousness, why don’t more intrapreneurs succeed? Because in doing what is right, intrapreneurs hold a mirror up to their peers, forcing them to confront what they and their company have become. Just like a middle-aged weekend warrior exercising after years of complacency, when a stagnant company tries to transform into a high-growth business, the picture is not very pretty. When You Are The Intrapreneur, What Should You Do? You see your organization going along to get along but you can’t. Your owners are threatened, weak and don’t really want to change. Let’s face it, when under pressure to grow, organizations of all kinds look to their roots and their previous successes for answers. Rekindling business growth inside an organization often represents the toughest challenge to a maturing organization. Can it regain its entrepreneurial spirit and continue to thrive despite its mature culture? By turning to intrapreneurs, the company hopes it can have the best of both worlds. It can work if owners follow the above steps. Intrapreneurs, by definition, embody the same characteristics as the entrepreneur: conviction, passion, and drive. The more the intrapreneur expresses him or herself, the more the company is forced to confront its own effectiveness. If the company is supportive, the intrapreneur succeeds. When the organization is not, the intrapreneur usually fails or leaves to start a new company. Every effective worker has intrapreneurial traits that may or may not culminate in an entrepreneurial life. Ask yourself how close are you to becoming an entrepreneur? Your answer will help you to decide whether you should stay or you should go! Andrew J. Birol of Birol Growth Consulting helps owners grow their businesses by growing their best and highest use. Contact Andy at 440-349-1970 or AndyBirol.com.